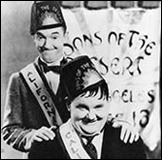 The Sons of the Desert is an organization with scholarly overtones and heavily social undertones devoted to the loving study of the persons and films of Stan Laurel and Oliver Hardy. The founding members are Orson Bean, Al Kilgore, John McCabe, Chuck McCann, and John Municino. All officers and Board Members-at-Large shall sit at an exalted place at the annual banquet table. The officers and Board Members-at-Large shall have absolutely no authority whatever. Despite his absolute lack of authority, the Grand Sheik or his deputy shall act as chairman at all meetings, and will follow the standard parliamentary procedure in conducting same. At the meetings, it is hoped that the innate dignity, sensitivity, and good taste of the members assembled will permit activities to be conducted with a lively sense of deportment and good order. Showing of Laurel and Hardy film. Stan has suggested this period. In his words: "All members are requested to park their camels and hire a taxi; then return for 'One for the desert'!" "To Mae Busch and Charley Hall - who are eternally ever-popular." Section "h" above shall include the reading of scholarly papers on Laurel and Hardy. Any member going over an 8 1/2 minute time limit will have his cocktails limited to fourteen. Hopefully, and seriously, The Sons of the Desert, in the strong desire to perpetuate the spirit and genius of Laurel and Hardy, will conduct activities ultimately and always devoted to the preservation of their films and the encouragement of their showing everywhere. There shall be member societies in other cities called "Tents," each of which shall derive its name from one of the films. Stan has suggested that members might wear a fez or blazer patch with an appropriate motto. He says: "I hope that the motto can be blue and gray, showing two derbies with these words superimposed: 'Two minds without a single thought'." These words have duly been set into the delightful escutcheon created for The Sons of the Desert by Al Kilgore. They have been rendered into Latin in the spirit of Stan's dictum that our organization should have, to use his words, "a half-assed dignity" about it. We shall strive to maintain precisely that kind of dignity at all costs-at all times.